Much to my surprise, and my coworkers were stunned... The cat is out of the bag there... 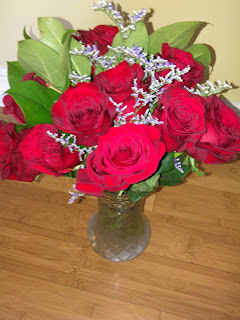 I waited until I got home and had the roses cut and in the vase, and when I took the photo, I sat on the floor and cried. They were happy tears, as I was overwhelmed by the gift. I am so blessed to have met this wonderful man. I do believe that my 46th year will be one of the best to date. I'm almost crying with you. What a thoughtful man. Enjoy your day and the time with your lovely man. That is so sweet. I would have cried, too.